I have a list of ingredients but no recipe name or method - does anyone know what it may be? I guess you must have to mix the two lots together and then combine but I'm just not sure how and what it makes! Sounds good though. As @ChrisH has suggested, someone may have been modifying the recipe to use ready-made cake, such as a Madeira. And, in the interest of not presenting a full recipe, here is my abridged version of the directions; follow the link for the full details. Prepare the cake layers the day before you plan to assemble the tiramisu. The next day, prepare the coffee syrup. Pour the hot coffee into a bowl, add the sugar and chopped chocolate and stir until smooth and the chocolate has completely melted. Prepare the mascarpone cream. Melt the white chocolate in a bowl over a pan of simmering water. Stir until smooth, then set aside to cool slightly. In a bowl, whisk the egg yolks and caster sugar until the mixture has doubled in volume and leaves a ribbon trail when the whisk is lifted. Add the mascarpone and melted white chocolate and whisk again until smooth. In another bowl, whisk the egg whites with a pinch of salt until they hold a stiff peak. Fold the egg whites into the mascarpone mixture using a large metal spoon. 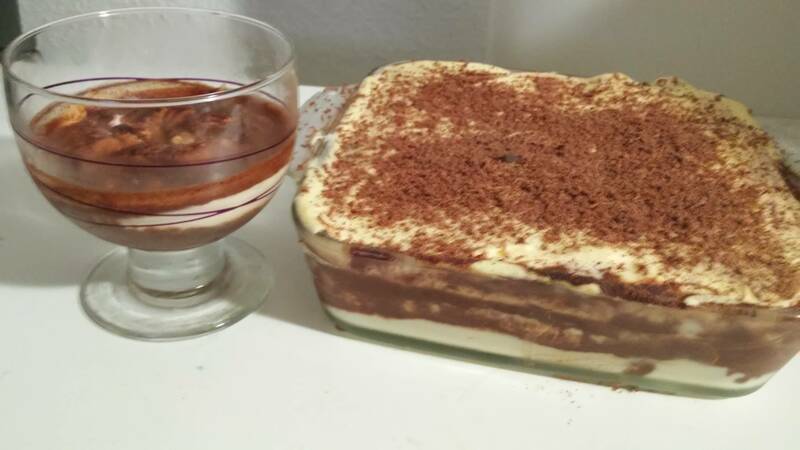 To assemble the tiramisu, spoon a layer of the mascarpone cream into the bottom of each of glass and top with a layer of cake. Drizzle liberally with the coffee syrup. Add another layer of the cream, cake, syrup and a final layer of cream. Serve chilled, perhaps scattered with white and dark chocolate shavings. Mixing them together would give you a sauce (if incorporated properly first). It could be an interesting new thing if you need it, but I can't imagine that many places to use it. 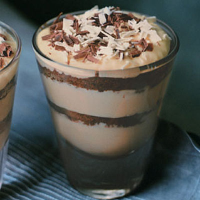 For me, this is clearly intended as a Tiramisu recipe, slightly non-traditional. Somebody left out the lady fingers. You mix the first ingredients to make moccha, then pour it over the lady fingers. For the cream, there are two possibilities. One is to use all ingredients. Beat the yolks with the sugar to ribbons, add the mascarpone, then slowly add the just-melted chocolate. Fold in the eggwhites beaten to soft peaks. Put over the ladyfingers, and when hardened in the fridge, sift cocoa powder over it. While this is more likely, I don't see cocoa powder in the ingredients either. Also, so much cocoa might be so strong as to dominate the subtle taste of white chocolate. So you could make the same cream, leaving out the melted chocolate. Then, when the tiramisu has set, cover with grated white chocolate. This is also easier to make, if you are not experienced making creams and working with melted chocolate. Update I made the recipe yesterday, now it has set after a night in the fridge. 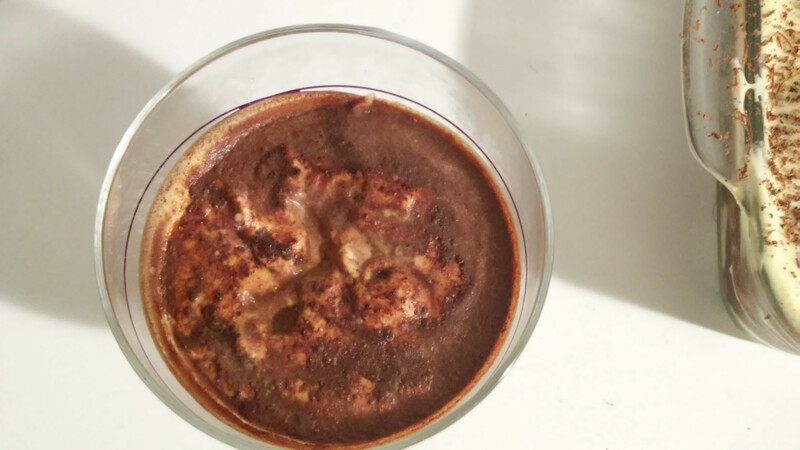 I put 90 g of the cream in an ice cream cup, and poured 30 g of the coffee mixture on it. Then I layered the rest as a normal mascarpone, using storebought lady fingers. The version in the bowl could have used improvement. Some of the liquid found a way to flow to the bottom of the cup. The rest of it stayed on top, where it made a not-so-appetizing surface, slightly seeping into the cream. It did harden in the end, but it is not something a master pattisier would have made. If you insist on using it this way, you should do something else. For example, you could make a ganache by using 200 g of chocolate and 75 g of coffee, instead of the other way round. You can throw in a bit of instant coffee if you want a stronger taste. 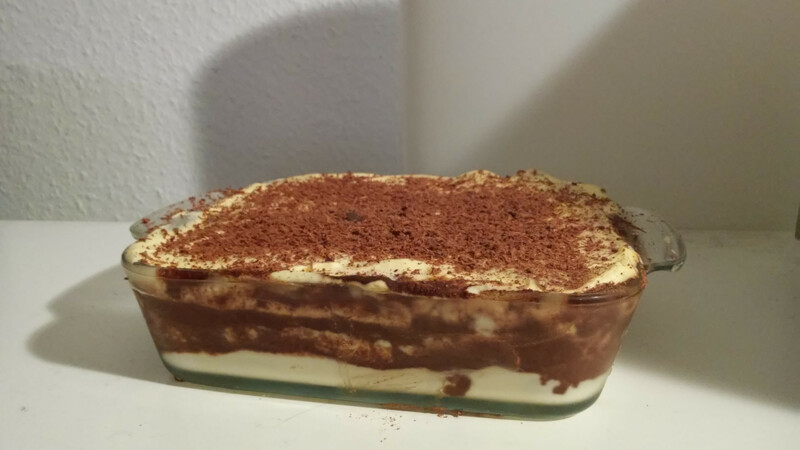 The tiramisu looks like a standard tiramisu. It layered well, the amount of liquid was just enough to soak two layers of ladyfingers. All in all, it seems like a good recipe. I have not eaten it yet, but I am certain it will taste delicious. I'm thinking that that the coffee and sugar would be mixed with the melted dark chocolate for the last step of the recipe. 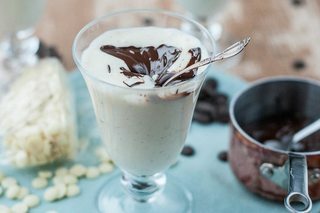 EDIT: You would probably need to halve the coffee, sugar, and dark chocolate if you were to use the amounts in this recipe for the cream portion. It may be up to some experimenting to get the final result to your liking. Not the answer you're looking for? Browse other questions tagged chocolate coffee pudding or ask your own question. How often should I clean my coffeepot, and what is the preferred method? Which brewing method extracts more flavors from the coffee bean? Vanilla Pudding: Could someone explain this recipe to me? How to scale up pudding recipe 10x? What is the name of this Turkish chocolate?